In order to explain and emphasize the importance of what being a NextGen Trail Leader means to me, I must first take you on a journey of how I started my career in the outdoor industry. I started my outdoor journey in the Winter of 2013. When I first matriculated at North Carolina Agricultural and Technical State University (NCA&TSU), I was unhappy. I was searching for direction. Unbeknownst to me, withdrawing from college would catapult me into my purpose. I left school, ended my lease, and rid myself of most of my belongings to move to Minneapolis, MN to start my outdoor career with Wilderness Inquiry. Even though I was a complete novice, they accepted me on the merit of my soft skills, alone. As weeks turned into months and months into years, I learned about the diversity and inclusion issues plaguing the industry, but I had no solutions, nor did I know how I could assist in solving the problem. I started to come into my own as I was invited to be a part of and speak at conferences held by the Children and Nature Network (CNN) and the Associations of Partners for Public Lands on my journey of connecting with inner city youth and working with people with disabilities in the outdoor realm. I found myself as a Natural Leader with CNN, a liaison between the NPS and Minneapolis Public School system, a mentor for classified "at-risk" youth, an avid and professional water recreationalist, and an ambassador for Wilderness Inquiry's Canoemobile initiative. This would continue as I shifted to Environmental Traveling Companions in San Francisco, CA to lead a 21-day trip in partnership with Summer Search. While in San Francisco, I was invited by the Outdoors Empowered Network to their first summit and to Teresa Baker's first Diversity and Inclusion Summit in Yosemite National Park. Then in the Fall of 2015, I decided to return to NCA&TSU to continue my education. But, I was different this time in that I had a specific goal with the resources to accomplish it. "From being unhappy and searching for direction, I now found myself – an underrepresented voice, along with over 100 other advocates for public lands, advocating in Washington D.C. for Hike The Hill®"
During my outdoor tenure, I couldn't help but realize that I was the only person of color at my organization and why there was an imperative need for Teresa Baker to hold a summit in Yosemite on how we need to start talking about the solution to inclusiveness rather than the problem. This inspired me to start planning and leading trips for the students of NCA&TSU. The following semester, I became a National Park Service (NPS) Campus Ambassador for Outdoor Nation, and recently joined the first cohort of NextGen Trail Leaders for the American Hiking Society. From being unhappy and searching for direction, I now found myself – an underrepresented voice, along with over 100 other advocates for public lands, advocating in Washington D.C. for Hike The Hill®. I never would have imagined that my journey from seeking my purpose, would take me to speak about the importance of funding and providing continuing support for the Land and Water Conservation Fund with the office of Richard Burr - a North Carolina Senator. Nor would I believed that I would provide support to a fellow colleague, as he presented his case to a Representative of Idaho to say no to H.R. 1349 – a bill amending the Wilderness Act . I found it surreal to think about my journey and the path that I chose as I stood in the historic U.S. Senate Kennedy Caucus Room to celebrate the 50th Anniversary of both the National Trails System Act of 1968, and the Wild & Scenic Rivers Act of 1968. American Hiking Society's Hike The Hill® helped me do more than just exist in a vastly white space – it gave me a voice. 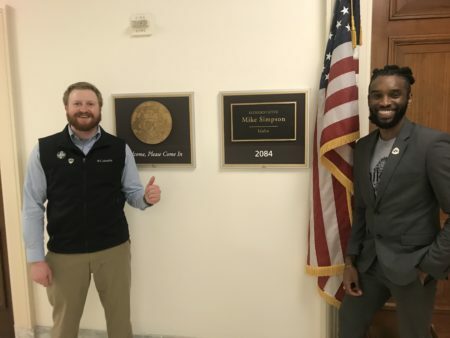 Whether I was attending meetings with Congress or discussing public land solutions with my fellow NextGen peers, I saw myself becoming a part of the solution to address the diversity issues in the industry. The NextGen Trail Leader program instilled in me the importance of the work that I do and gave me the passion and the vision to ensure that our conservation efforts continue to make an impact for this generation and the generations to come. "American Hiking Society's Hike The Hill® helped me do more than just exist in a vastly white space – it gave me a voice." Ronald Griswell has worked in the outdoor recreation industry for a little over five years. 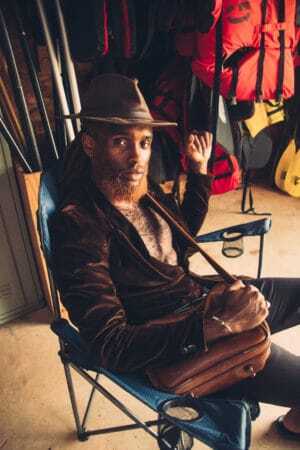 His focus has been on connecting inner city youth with nature through canoeing and science based experiential learning. As a recent graduate of North Carolina A&T State University, his focus has shifted to engaging with HBCU's. He is currently the Outdoor Program Coordinator and Advisor to his Alma Mata - helping develop and further increase the student participation in various outdoor activities. 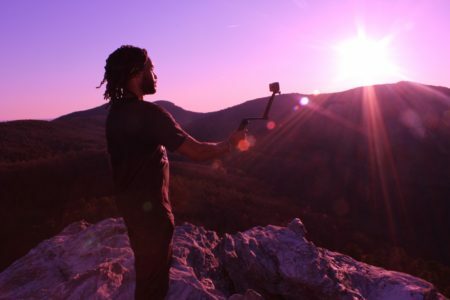 Ronald is also an American Hiking Society NextGen Trail Leader, and a Natural Leader with the Children and Nature Network, and now founder of his own nonprofit - HBCUs Outside.